I had this photo saved up for over a month to use yesterday, and then at the last minute… I forgot. In my defence that’s probably due to the fact that we don’t really celebrate Valentine’s Day. And I was giddy over actually getting some sewing done, and FB having trousers that were long enough for the first time since his growth spurt just after LR was born. 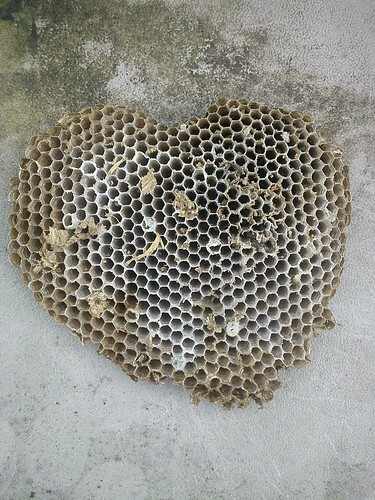 But this heart came from a wasp nest that grew in our allotment shed last summer, inside a bag of straw. We had a good nosy at it one Saturday morning in January, FB and I. Even though wasps are scary. But all the wasps had gone. And what they had left behind was pretty. And amazing really.